Just how much does Bryant & Stratton College - Greece cost for tuition at this time, and how much is tuition forecasted to change? How does tuition contrast with the average? Keep reading to find out. See how fees and tuition at Bryant & Stratton College - Greece measure up to other U.S. colleges and universities and see what you can do to properly get ready for probable tuition increases. For nationwide, regional and statewide comparisons, view the table below to see how Bryant & Stratton College - Greece measures up to other schools. In the 2017 - 2018 school year, full time undergrads at Bryant & Stratton College - Greece paid $16,216, prior to corrections for financial need. Of that number, the expense of tuition came to $16,198. The remaining $18 represents additional fees. In contrast to public colleges, Bryant & Stratton College - Greece does not provide a tuition discount to residents of the state. Bryant & Stratton College - Greece fees and tuition is the number billed to undergraduates for one academic year, and does not include room and board. However, most students wind up paying below full tuition after collecting financial aid as well as other discounts. The next table outlines the costs explained above for the 2017 - 2018 academic year. How much does Bryant & Stratton College - Greece cost part time? For more info, click Bryant & Stratton College - Greece Part Time Tuition & Fees. There has been a rise of 1.7% in Bryant & Stratton College - Greece fees and tuition for out-of-state students in the past 5 years. Tuition expanded by 1.7% and fees expanded by -5.0%. This year, undergrads should anticipate paying $16,495 if the growth keeps up. Because of price increases, the full cost of a four-year degree from Bryant & Stratton College - Greece will be $67,702, and the full expense of a two-year degree would be $33,274, not including additional charges such as books, transportation, and room and board. 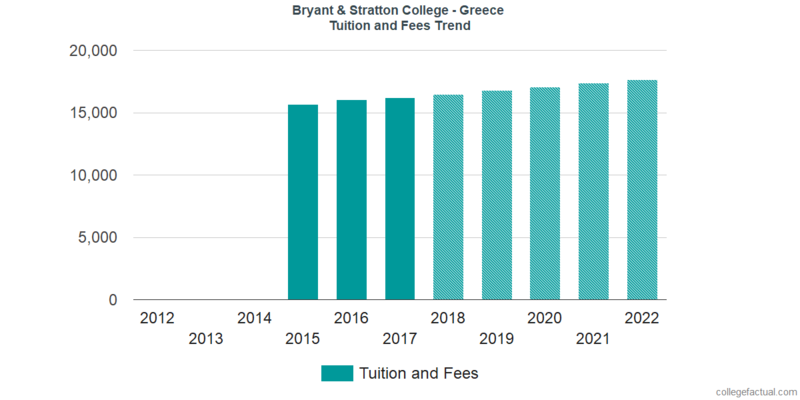 Take a look at the following chart to discern how Bryant & Stratton College - Greece fees and tuition may increase in the future. Mainly due to inflation as well as other factors, the price of college is likely to grow every year. For this reason your final year of college might be much more than your initial year.